The church is right off of a metro station. 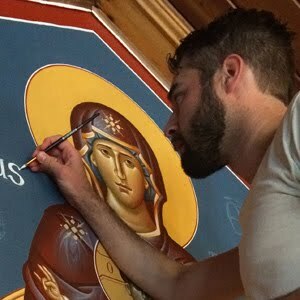 My plan was to buy his icon this morning, go to my lesson, then take the metro from my lesson to the church of St. John. I started at an icon shop near my apartment. The icons were made to look old (rough and black around the edges...personally I don't care for this style). I moved along to another icon store down the street. They had a nice, large icon of St. Nicholas standing, vested. Nice. I asked for another (St. Mary's will get one, and I'd like one as well). They had a smaller icon as well. I was ready to go to my lesson and then to St. Nicholas. On the way to my lesson, I passed another store, so I stopped in. This little store is across the street from the ancient Church of the St. Theodores and is run by the nicest people. Of course they had a really nice, large icon of St. Nicholas Planas (I'm not worried about finding a home for this icon). 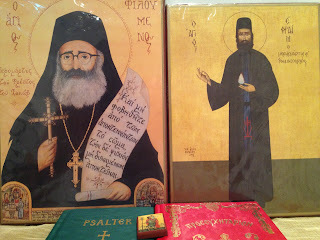 I also found two other beautiful icons I will bring home to my parish church of St. Mary's. The first was St. Ephraim of Nea Makri was a monk near Athens, martyred by pirates and forgotten for 500 years until he recently revealed himself...I will visit him soon. I also found St. Philomenos, who was a priest monk at Jacob's Well in Samaria (where Christ met the samaritan woman at the well). 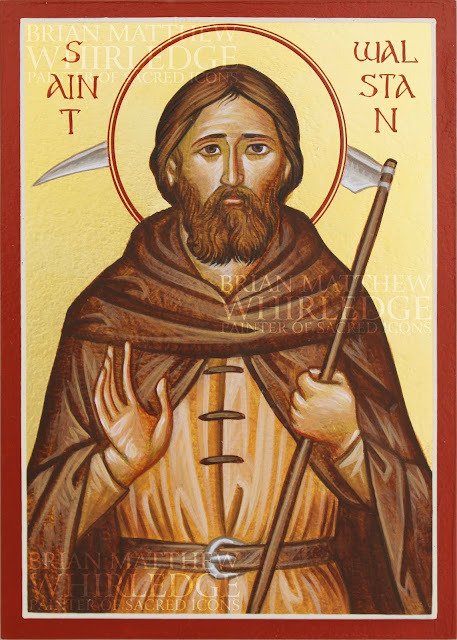 He was recently martyred by the Jews in 1979 who demanded they have "their" well, so they clove his face in a cross with an axe. I also asked about an icon of St. Philothei (a nun martyred by the Turks, whose relics are in the cathedral a block from my apartment). They didn't have it, but would make one for me by Friday. The store owner gave me a small icon of St. Christopher as I was leaving. "Put it in your car." This held me up a bit from my lesson, which ran late, so I didn't make it to the church of St. John (then at least). At my lesson, we studied rhythm. 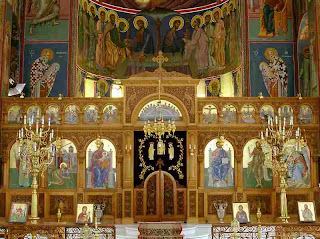 The rhythm of Byzantine chant follows the natural patterns of the accents in the text. It becomes interesting because the hymns are written an prose, so mosty are not metered. The melody rises with main ideas in the text, and the rhythm places the accents on downbeats. This can mean that a "measure" can have 2, 3, or 4 beats, and although a 2-beat rhythm is the norm, a time signature is not constant through a hymn (although the ancient hymns kept a strict 2-beat rhythm). An accented syllable should usually fall on a downbeat and/or can be held for two beats to preserve the rhythm. Also, if the accented syllable won't land on the downbeat, the melody should rise to accomodate this. We sang a number of hymns in plagal fourth mode (the major mode in western music). The main emphasis was practicing moving my hand in the rhythm (difficult because the meter is not constant). My teacher told me "Rhythm is in the body, not the mind, so you must move your body (hand) to keep the rhythm. It is a natural tendency and should not be suppressed." 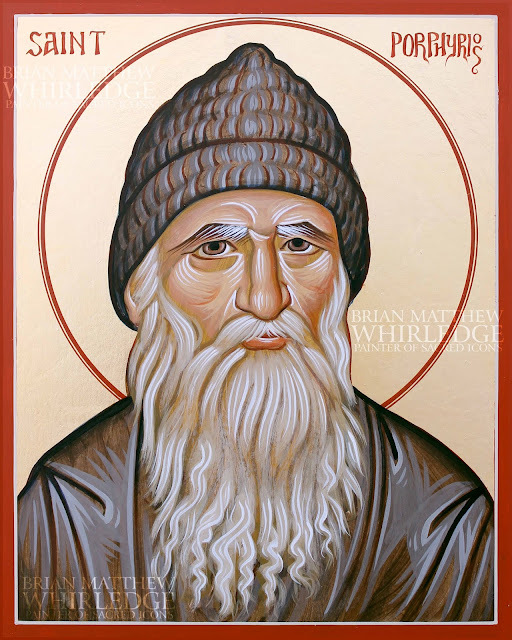 I have noticed this with the cantors of St. Irene's as they chant. As an aside, the ancient chant had a system of chieronomy, or hand gestures, to communicate the melody to the choir (contrasted with modern western direction which only shows rhythm and expression). For various reasons (written notation being one), the ancient chieronomy became extinct, although my teacher and his teacher, Simon Karas, have discovered some hand gestures, which may be used to distinguish certain notes. 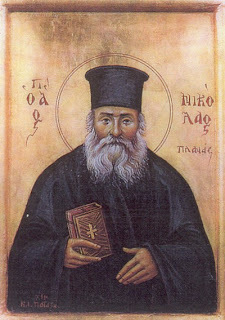 Other directors, such as Lycourgos Angelopoulos, have developed their own chieronomy to "paint" the melody in the air. After the lesson (it was too late to visit St. Nicholas; the church closes at 1pm) I returned to my apartment. I spent the afternoon reading and practicing. Fortunately, the Church of St. John opens in the evening from 5-7. Doubly fortunately, Arvanitis was kind enough to schedule a second lesson for this evening. I left around 5pm for Syntagma, where I boarded the Metro red line towards Agios Demitrios. 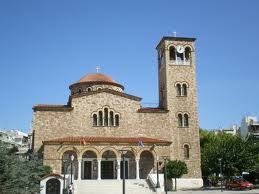 I departed at Agios Ioannis (St. John). Just as described, the metro station opened up on the square of the church. You can't miss it. The church is dedicated to St. John the Baptist. I have been unable to find out the origin of the appellation "the Hunter." 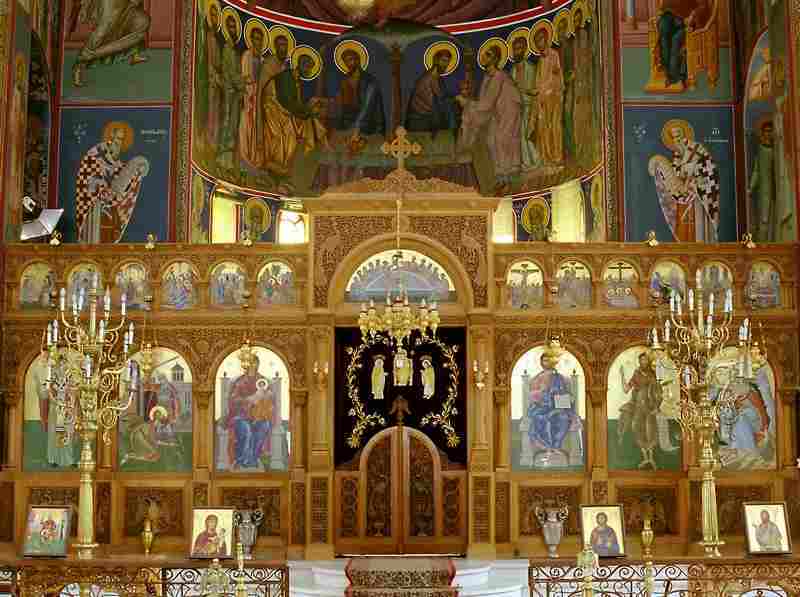 The church is relatively new (rebuilt at some point after the repose of St. Nicholas) and is beautiful. 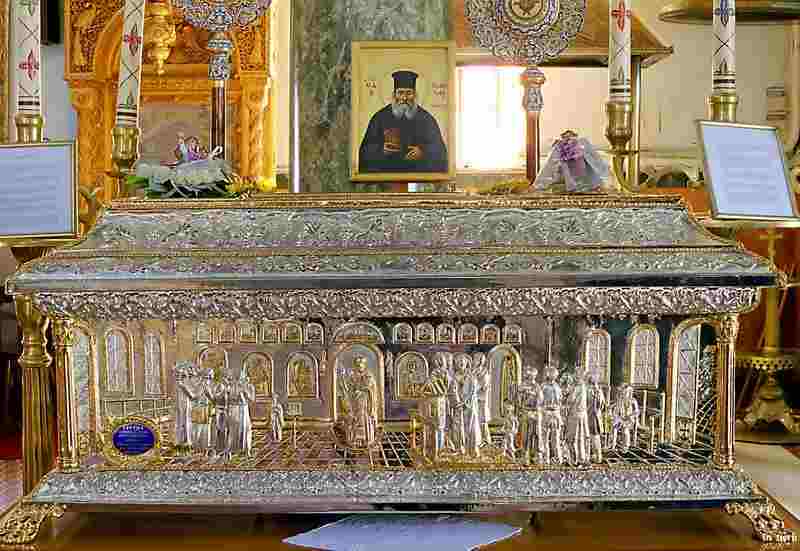 I entered the church and venerated the holy relics of St. Papa Nicholas Planas. The men tending the church were very nice and will have the priest bless the icons on the relics of St. Nicholas, where they will stay for two weeks, and I will get them before I leave. 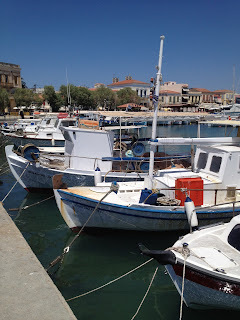 I took the subway to Panepistimiou and walked to my lesson. We continued working on rhythm and hand movements. We studied characteristics of the first (minor) and fourth (dominant note is the third of the major scale...no true equivalent in western music). We also chanted in English for the first time: psalms 140 and 141 from vespers in the first mode. Based on what I just learned about rhythmic accents, I placed the barlines in the melody (they were absent in the score). I bought from fruit, vegetables, and pita from the grocery, and made dinner at home. 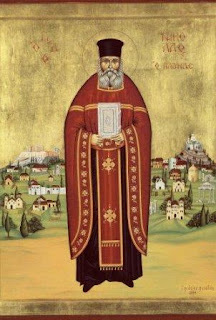 I will close this post with two hymns for St. Nicholas Planas: As a simple shepherd of Christ God's lambs, thou didst tend thy flock well on the pasture of piety, nourishing their spirits with ceaseless supplications and leading them to Christ, O wise Father Nicholas. Humble of spirit and pure of heart, illustrious in life and dispassionate of a truth, wast thou, O wise one. 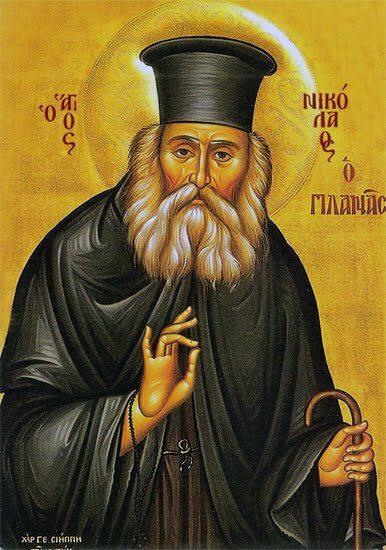 Thou didst illumine all by the virtues and dost grant grace unto them that draw nigh unto thee; and by thine intercessions, thou dost heal them that call upon thee, O Father Nicholas.